You can bowl in them. Find an illicit dice game in them. Set the climax of a noir detective novel in them. And now, procure some smoked prime beef ribs in them. Well, in one of them. 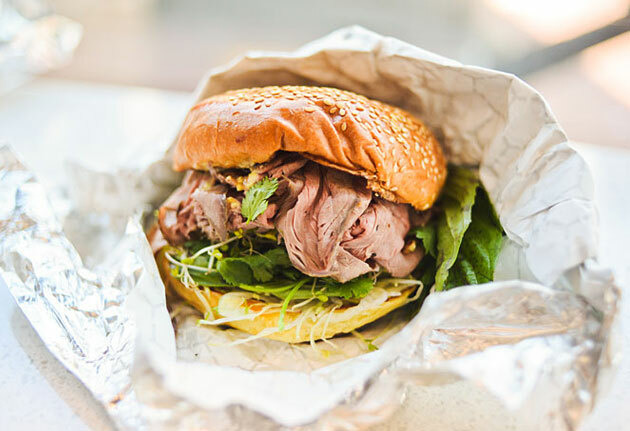 That one: Pitmasters Back Alley BBQ, a takeout operation from the folks behind Wagshal’s, the 90-year-old meat-and-sandwich purveyors in Spring Valley. They’ve been doing limited delivery to their neighborhood, but now you can order for carryout as well. So, yeah, you can’t sit down here. Though you’ll want to. (See what we mean here.) When you find the door with the pig on it and walk through, it’s all corrugated tin, barnwood and chalkboard menus. But never mind those. You’ll have already checked out the menu online, ordered ahead and showed up 30 minutes later to pick up your meat. Dry-aged Texas-style brisket, those prime beef ribs, Tennessee-style chicken thighs—it’s all fair game. And much of it is made with recipes borrowed from competitive BBQ teams. Throw in some sides like cheddar biscuits or Mother in Law (green-mango slaw) and bring it all back home, where, somewhere, there’s bound to be a basketball game starting.